As your road bike takes you up mountain passes, along glistening rivers, through jagged valleys, it’s the beauty of Vietnam's landscape that will make you happy to be riding on the newly-built Ho Chi Minh Highway. Of course, other sites on this historic road will make you pause and contemplate the past, but let the scenery wash over you as we explore this remote area of Vietnam. The wide, smooth undulating highway is a bikers dream as there is little traffic on the road. Our route of 922 km will take us through farms, orchards, tribal villages and offers us easy access to spectacular scenery, one of Vietnam’s most spectacular caves, war sites and the ancient royal seat of Hue. Once a small track used only by locals and ponies, the Ho Chi Minh Trail expanded into an elaborate system of mountain and jungle trails to roads for vehicles to transport troops, millions of tons of foodstuff, weapons, and other essentials during the war. This web of trails ran for 2,000 km, roughly parallel to the Vietnam/Laos border, along the Truong Son Mountains. Today, the many paths criss-cross the Ho Chi Minh Highway which was started in 2000 to provide a parallel alternative to the busy Highway 1 on the coast. As of 2014, the vast majority of the highway, 1,700 km, between Hanoi in the north and Saigon in the south, has been completed. This well-made, paved road cuts through some spectacular landscape and our tour takes you through the most scenic northern to central section, ending in Hue. We meet at the hotel for a trip briefing and a welcome dinner. We leave Hanoi, transferring just outside the city to start our riding. We ride along the undulating valley of the Song Ma River as we head towards Hoi Xuan. Take a short transfer to avoid the main road, then we start to ride on the wide and newly-built Ho Chi Minh Highway, which we’ll have virtually to ourselves. Back on the Ho Chi Minh Highway, we wind through lush jungle and beautiful villages nestled under the Truong Son mountain range. From Pho Chau, the Ho Chi Minh Highway is still a dream to ride on and you’ll appreciate the smooth tarmac as the mountains rise and the road winds up and down along the hillsides. We take a boat to visit part of Phong Nha Cave, then get back on our bikes to cycle a gentle ride on a flat road to the seaside village of Dong Hoi. Today, there will be many reminders of the as our ride today takes us across the DMZ (Demilitarized Zone, also known as the 17th Parallel) to Cam Lo. We visit to the Khe Sanh combat base, where relics of the war are exhibited. Then we enjoy a traffic-free ride undulating along the Dak Rong River. We ride downhill to Hue, Vietnam’s Imperial City, a UNESCO World Heritage Site. We ride through the middle of Vietnam for 60 km on backroads before hitting Highway 1, just a few kilometres south of Hue. We end the tour, but you can extend your travels. Day 2 - Hanoi - Mai Chau - Phu Luong Ride 70km. +1,296m / -1,162m. Perfect variety of local food in combination with intense cycling. What an experience! Our guide and driver went above and beyond. Biking was fun and challenging, scenery amazing, food plentiful and diverse, bikes were solid. First SpiceRoads tour, definitely not the last. My first visit to Vietnam, and my first trip with Spice Roads lived up to my high hopes: adventurous cycling, on good roads, while exploring the rural countryside from Hanoi to Hue along the well paved Ho Chi Minh Highway, coupled with reviewing the history of the region. The wide, smooth undulating highway is a biker’s dream as there is little traffic on the road. Our route of 922 km will take us through farms, orchards, and tribal villages and offers us easy access to spectacular scenery, one of Vietnam’s most spectacular caves, war sites, and the ancient royal seat of Hue. Suitability: This trip is suitable for those with a sport-level of fitness. Fitness will be a huge asset on those long days and on the undulating hills. The tour is fully supported, and the bus is always close at hand for those that find the riding too difficult. Biking Conditions: We ride between 50 km and 150 km a day for a total of 922 km in 9 cycling days. Though the distances may not be that long, the climbs will be tough and challenging. The roads are 100% tarmac in good condition, and the traffic will be light. We meet at the hotel in the late afternoon for a trip briefing followed by a welcome dinner at a fine Hanoi restaurant. We leave the hustle and bustle of Hanoi and transfer just outside the city to start our riding. We cycle on along small roads passing many Hmong, Dao, and Thai villages with spectacular views of lush vegetation and green rice paddies. We start off easy, and there will be some rolling climbs, but nothing too steep. Depending on how your legs feel, we may have a short transfer to our overnight stop in a Thai ethnic stilt house in Mai Chau Valley. We ride along the stunning and undulating valley of the Song Ma River as we head towards Hoi Xuan. This route was used to carry supplies and ammunition during the war and linked to the main part of the Ho Chi Minh Trail. The route then takes us away from the river through the range of mountains that stretch from Mai Chau to Cuc Phuong and to Hoa Lu. The road gets more beautiful as you ride closer to Ngoc Lac with looming limestone cliffs and lush vegetation. We overnight in this small town. We start the day with a short transfer to avoid the main road to Lam Son. We ride on the wide and newly-built Ho Chi Minh Highway, which we’ll have virtually to ourselves. The tarmac makes for smooth and fast riding with 360-degree picturesque scenery. Riding through the fertile area, we'll see such crops as coffee, rubber, tea, and various fruits. We will arrive in Thai Hoa late in the afternoon. Following breakfast, we are back on the Ho Chi Minh Highway. The road winds through lush jungle and beautiful villages nestled under the Truong Son mountain range. During our cycle, take the time to admire the stunning scenery and the serene karst formations. We reach the remote town of Pho Chau in Nghe province at the end of the day, where we stay at a local guesthouse. From Pho Chau, the Ho Chi Minh Highway is still a dream to ride on and you’ll appreciate the smooth tarmac as the mountains rise and the road winds up and down along the hillsides. The scenery is impressive, and the road is tranquil. We ride to Phong Nha National Park, which contains one of the most magnificent caves in Vietnam. A true speleological wonder with 65 km of caves and underground rivers, formed approximately 250 million years ago, the caves were used as a hospital and ammunition depot during the war, and the entrance still shows evidence of attacks from fighter air-craft. Nearby, there are community projects underway with Flora and Fauna International, and it may be possible to visit village initiatives creating habi-tat corridors to help to maintain the forest’s ecosystem. This morning, we board a boat to visit the first 600 m of Phong Nha Cave. When we reach the cave’s gaping entrance the engine is cut, and you’re transported to another world as you’re paddled through illuminated cavern after cavern. We then have the option to climb 330 steps up to Tien Son Cave, a dry cave in the mountainside used as a hospital and ammunition depot during the American War and consequently was heavily bombed. Our afternoon cycle will be a gentle ride on a flat road to the seaside village of Dong Hoi. The village has beautiful white sand beaches for 12 km long. Today, there will be many reminders of the war that forced the creation of the Ho Chi Minh Trail. Our ride takes us across the DMZ (Demilitarized Zone, also known as the 17th Parallel) to Cam Lo. The DMZ was the dividing border between North and South Vietnam, and troops of both governments were barred from 5 km on either side of the border. The road is now quite flat, and we make good time and stop to visit Truong Son Cemetery, a memorial to the tens of thousands of North Vietnamese soldiers who were killed on the DMZ and on Ho Chi Minh Trail. It’s just 14 km further to the town of Cam Lo, and here the trail heads across the border into Laos. We then transfer to Khe Sanh, the site of a former US marine base and the in-famous 1968 battle of Khe Sanh (longest battle in Vietnam War), near the Laos border to overnight. We start the morning with a visit to the Khe Sanh combat base, where relics of the war are exhibited, and see the airstrip used to transport troops and supplies, and where to this day nothing will grow. We ride through spectacular scenery, mainly downhill, from the Laos border to Dak Rong River. We cross the bridge and ride along the river and what was considered the southern part of the Ho Chi Minh Trail. Again, enjoy a traffic-free road, the terrain undulates and it’s a nice contrast to the flat plains of the previous day's ride. Begin the beautiful ride downhill to Hue, Vietnam’s Imperial City, a UNESCO World Heritage Site. We ride through the middle of Vietnam for 60 km on backroads before hitting Highway 1, just a few kilometres south of Hue. We stop on our way to visit the Imperial City, which once served as Vietnam's capital from 1802 to 1945, under the Nguyen Dynasty. The citadel is protected by fortified ramparts and ringed by a moat. During the Vietnam War, the Imperial City was heavily damaged, but it is slowly being restored to its former glory. We ride on backroads to our hotel and prepare for a farewell dinner. 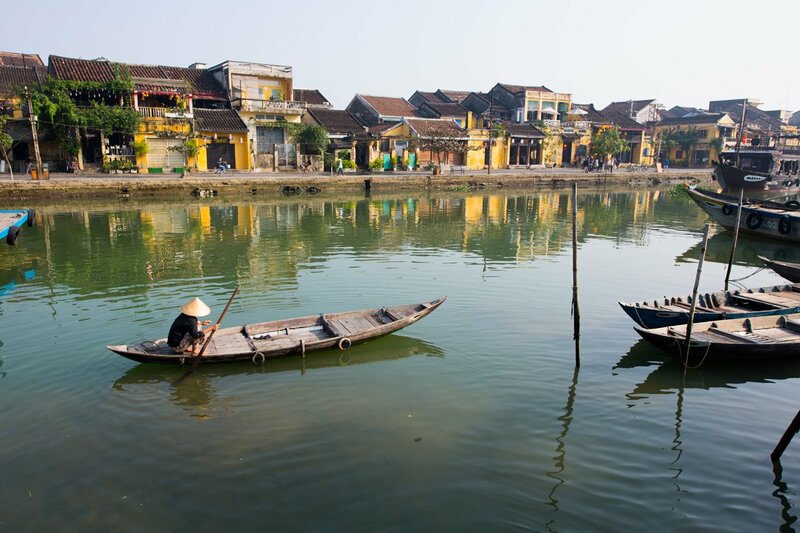 We end the tour, but you may choose to extend your time in Hue, visit Hoi An, or travel to Ho Chi Minh City. Because some people can't imagine going on a trip without their own beloved bicycle, we do not provide them as part of this tour. However, you can hire bikes locally for the price listed in the tour pricing section. The bikes are road bikes (Giant Anyroad 2 with Shimano 9-speed shifting and SRAM disc brakes).